Medicinal uses: Chinese: used as a blood tonic for deficiency conditions such as anemia, palpitations, and lowered vitality. Also regulates the menstrual cycle and is a warming herb to the circulatory system. European: a warming tonic herb for digestion and circulation, but does not have the same tonic action as Chinese angelica (Chevallier 63). Additional uses: The stem of European angelica can be candied. The root and seeds have been used to flavor liquors with their licorice-like flavor. 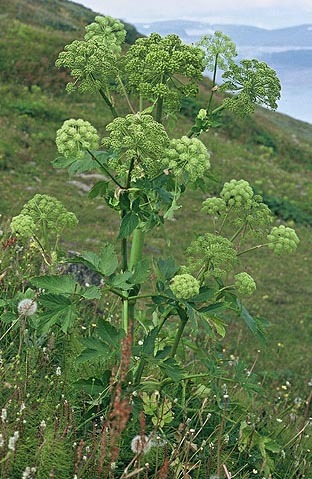 As a dye plant angelica produces a green dye when mordanted with iron (Kowalchik 13). Cautions: Do not take during pregnancy (Chevallier 63).